Marion Bond West is fascinated by honesty: honesty in others, honesty with herself, honesty with God. For almost forty years, she has written honestly about her life and God in a wide variety of books, magazines, and newspapers. Marion is a contributing editor of Guideposts magazine, having written for the internationally recognized publication and for the devotional book Daily Guideposts for more than thirty years. She and her husband, Gene Acuff, life in a Watkinsville, Georgia. This book was like eating peanuts - once I started reading one devotion, I couldn't stop. I really enjoyed the little stories of encouragement and they were very uplifting. These devotions are the favorites of the author after writing them for over 30 years for Guide Posts. I liked how each one had a corresponding Scripture and focused on keeping in the will of God and knowing Him better through His Word. 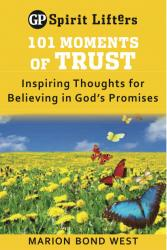 This e-book was very encouraging and inspiring and I really enjoyed it. I highly recommend it!